Police officers, ambulance drivers, and firefighters are immune from liability for accidents that occur while the driver is en route to an emergency. However, when emergency personnel drive in such a reckless way that bystanders are put at an unreasonable risk of harm, this immunity disappears. A case that came before the Kings County Superior Court asked the judge to decide whether a police officer had been reckless in pursuing a car at high speed against traffic on a one-way street after that police officer injured a bystanding driver. The recently-decided case is Fuchs v. City of New York. The plaintiff, Sara Fuchs, was driving on a one-way street when a New York Police Department patrol car being driven by a Police Officer Cuenca turned on the street traveling in the wrong direction and collided with her vehicle. The NYPD officer was following less than one car length behind the suspect being pursued, driving well over the speed limit, and had not called in the pursuit to his dispatcher. Fuchs was injured and filed a claim against the City of New York for money damages based on her injuries. The city filed a motion for summary judgment dismissing her claims, arguing that it had immunity from liability for her injuries under Vehicle and Traffic Law § 1104, due to the fact that the patrol car was involved in an emergency operation. New York Vehicle and Traffic Law § 1104 gives emergency personnel immunity from liability for accidents that occur while they are driving in response to an emergency. 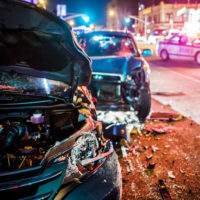 The statute lists several traffic laws that emergency personnel are, essentially, permitted to break while responding to an emergency, so long as the driver is not acting with recklessness while driving and exposing bystanders to a high risk of injury. Specifically, the statute allows officers and ambulance drivers to speed, ignore the direction of oncoming traffic, and drive through red lights or stop signs while pursuing an emergency. In its motion to dismiss Fuchs’ claims, the city pointed out that the NYPD officer had violated laws specifically listed in the statute, with its sirens and lights activated, while pursuing a suspected violator of the law. Fuchs argued that, since the officer had not called in the pursuit to his dispatcher before starting to chase the lawbreaking vehicle, the officer had behaved with reckless disregard for her safety. She noted that calling in high-speed pursuits and keeping dispatchers apprised of the pursued vehicle’s whereabouts and changes in direction was required under the NYPD Patrol Guide governing officer behavior. In her opinion, the judge explained that proving “reckless disregard,” required that an accident victim show proof that the officer “intentionally committed an act of unreasonable character in disregard of a known or obvious risk that was so great as to make it highly probable that harm would follow,” and “has done so with conscious indifference to the outcome.” This is a high standard to meet, essentially requiring that the victim show that the officer knew that their behavior would create a high chance that something catastrophic would happen to an innocent bystander, but acted anyhow. The judge ruled that it was by no means certain that calling in the chase to the dispatcher would have prevented or diminished the severity of the accident, and that failing to do so did not make Officer Cuenca reckless. Fuchs’ claims were dismissed. If you’ve been hurt in an accident with the NYPD or while riding New York public transportation, find out if you are a good candidate to file a lawsuit based on that claim by contacting the skilled and knowledgeable Manhattan personal injury lawyer Leandros A. Vrionedes for a consultation, at 212-889-9362, or in Queens at 718-777-5895.